Github Atom is my first choice text editor. I know that there are faster and more stable text editor out there, but I prefer open source solutions. 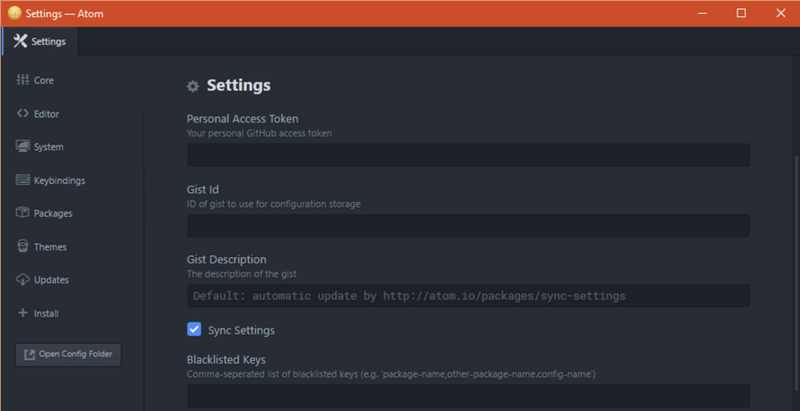 To install Github Atom, go to https://atom.io/ and download the installer. If you’re like me and you prefer latest features, you could use beta version by visiting https://atom.io/beta. 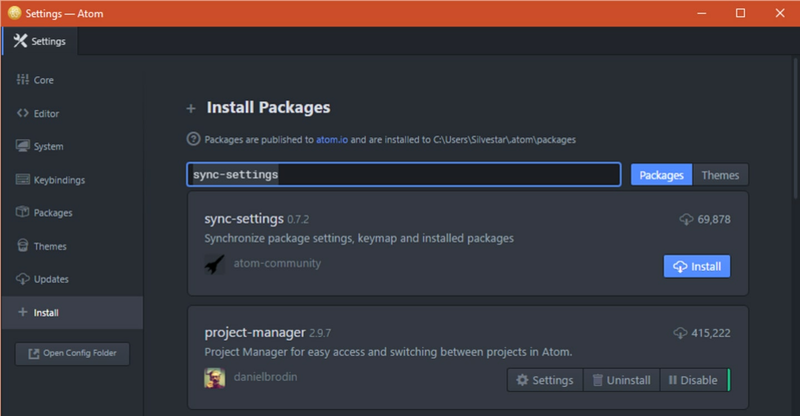 After you’ve installed Atom, you should install your first package—sync-settings. sync-settings is used to synchronize almost all of your editor’s settings. It is a very good starting point when you’re reinstalling Atom or installing Atom on a different device. It saved me plenty of time back in the day. First, open Atom settings. I’m a Windows user and default shortcut for Windows is ctrl-,. Go to Install, make sure you’re on Packages tab, type in “sync-settings” and press Enter. To install sync-settings, find package in a list (should be first on the list) and then click Install button. To configure sync-settings, you should have Github account. If you don’t have one already, create a new one, it’s free. After you’ve installed sync-settings package, click on Settings. In order to make your first backup, you should fill Personal Access Token and Gist Id. If you’re not familiar with this terms, please refer to sync-settings Setup section. Now, you should make your first backup. Open command palette by pressing ctrl-shift-p, enter “sync-settings”, select Sync Settings: Backup and press Enter. You’ve successfully created your first Atom settings backup. Whenever you install new package, edit or add new snippet or change shortcut, don’t forget to make a backup of your settings. If you have Atom installed on different device, sync-settings package should prompt you to restore your latest settings. That way you’re always in sync. I hope you found this article useful. For more articles, you should follow me on Twitter or checkout my Medium page.